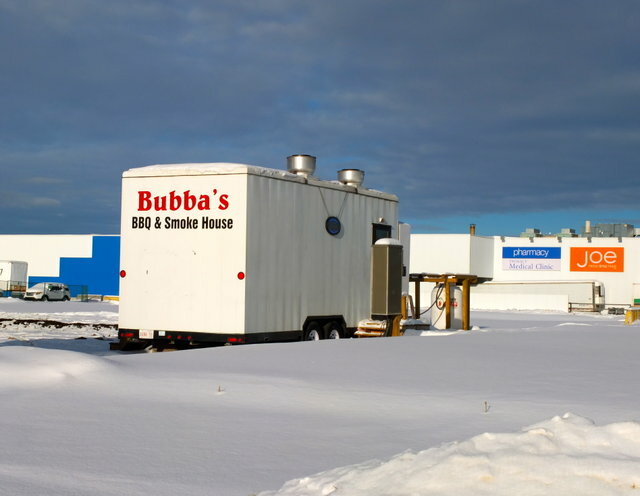 It can be tricky to find Bubba's BBQ & Smoke House, a small trailer parked in a lot just south of 48th Avenue on Gateway Blvd. 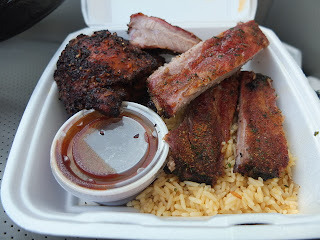 From that trailer, however, comes an aroma of barbecue that can be sensed by an attune nose blocks away. Open weekdays only during lunch (11:30am til the food runs out), Bubba's BBQ and Smoke House is the retirement project for the owner, "Bubba". Though he's not a formally trained chef, or from the South, he's loves barbecue and has studied the techniques on his own. Join the often lengthy line-up at his window early to get the entree of the day before it runs out ($11, cash only). There is no flexibility to choose your sides or entree, so adjust your schedule to get what you you want. One choice of canned soft drink, Pepsi, is available for an additional dollar. Be prepared to eat in your car, or to take in the scent of your food as you drive home, as there are no tables in the lot. Chicken and rib day (currently Mondays) is my present favourite. The smokey meat and spiced rubs smell (I'm always salivating by the time I get the food home) and taste heavenly. The accompanying sweet and savoury barbecue sauce is perfect on the meat, and also makes the otherwise basic side of rice more interesting. 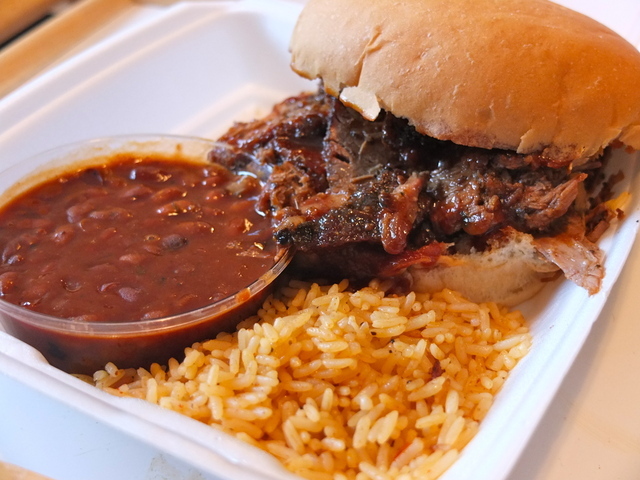 These days, if you're by on a Thursday you'll meet the hickory beef brisket. It's messy, smoky, hearty and succulent on a soft white bun. The beans are a tasty side, swimming in a tangy tomato based sauce. For something different, Wednesday offers the Carolina pulled pork sandwich with a mustard-based sauce, which is even more delicious when topped with the accompanying honey mustard coleslaw. If you prefer a tomato-based sauce, try Tuesday's Tennessee pulled pork. If you've got a craving for meat and have some time on your lunch break, venture to Bubba's for your fix. If you're particular, you can check for recent tweets or call for menu changes before you go. But if you just line up, and get whatever's Bubba's serving up that day, it's unlikely you'll be disappointed.